This is the debut album by young Polish Jazz quintet led by pianist / composer Mateusz SobiechowskiFind albums by this artist with saxophonist Marcin KaletkaFind albums by this artist, guitarist Szymon MikaFind albums by this artist, bassist Adam TadelFind albums by this artist and drummer Grzegorz PalkaFind albums by this artist, all representatives of the excellent young Polish Jazz generation. The album presents nine pieces, eight of which are original compositions by Sobiechowski and one is a standard. The album was released by the prestigious Dutch label ChallengeFind albums on this label Records, which recently entered the Polish Jazz realm. The recording was engineered my Maciej StachFind albums by this artist and offers a superb sound quality. The music is typical contemporary Polish / European mainstream Jazz, based on excellent compositions and performed with elegance and passion. Most of the themes are low key, full of characteristic Polish melancholy, which seems to be omnipresent on the majority of Polish Jazz recordings. The compositions are excellently structured, diverse and interesting enough to produce a fascinating continuity which keeps the listener on his toes. The performances are also top notch, obviously highly professional, but more importantly heartfelt, artistically inclined and highly aesthetic. All three front line players offer excellent soloing and the rhythm section does a perfect job all the way through, being supportive but not obtrusive. Personally I find the contributions by Mika to be slightly more focused and inspired than those of his peers, but that said, and as already stated, everybody plays splendidly. 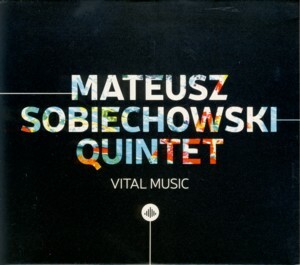 Sobiechowski solos relatively sparingly for a leader, which is much respected, as it contributes to the overall quintet´s team spirit and creates a coherent ensemble statement. Overall this is a very impressive debut, which offers both superb compositions and elegant execution, which would not shame veteran Jazz musicians anywhere on this planet. It is another manifestation of the strength of the Polish Jazz scene and its continuous development, which is now being recognized beyond the country´s borders. Warmly recommended to Jazz connoisseurs the world over!